iReporter J.T. 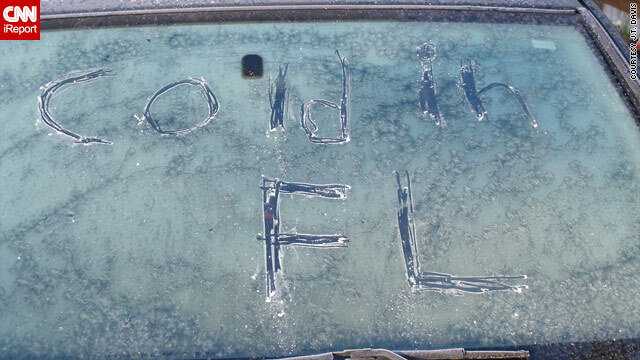 Davis says he woke up to icy, 17-degree weather in Perry, Florida, on Sunday. (CNN) -- Ordinarily a sunny playground that mocks the rest of winter-suffering America, Miami, Florida, was in sore need of a giant Snuggie on Sunday. There wasn't a scantily clad beautiful person at any of the outside tables at South Beach's tony Balans restaurant. Everyone was crammed inside to assuage their Saturday nights with pancakes and Cuban coffee, chuckling at the heat lamps that waiters had scrambled to put up outdoors. "Yeah, the lamps were not so good. So we brought inside all the tables to make sure our customers could manage," said manager Mike Fernandez. "I'm from Chile and living here, you know, it's not supposed to be like this." Temperatures in Miami barely got into the 40s on Sunday; normally, they'd be in the 70s. Some groves in the northern part of the growing area already sustained substantial damage Saturday night and Sunday morning, when temperatures dipped to 28 degrees or lower for at least six hours, said Andrew Meadows, spokesman for Florida Citrus Mutual, a group representing about 8,000 citrus growers in the state. It will take about five weeks to quantify the losses, he said. University of Florida wildlife biologist Dr. Frank Mazzotti was also working feverishly on Sunday. As part of an ongoing project, he and other scientists are working to euthanize iguanas, a non-native species that can disrupt the ecosystem. Cold weather makes his job easier: When temperatures drop, the iguanas, many up to 6 feet long, go into into a stunned, catatonic state, stiffen and fall to the ground from tree branches and other perches. The freeze is also going to be a test for the area's most unwelcome beast -- the Burmese python. The snakes have no natural predators and have been threatening the Everglades, the general ecosystem and even people since they were introduced to Florida through the illegal exotic animal trade, Mazzotti said. The problem was graphically driven home in October 2005 in Everglades National Park, when wildlife researchers photographed a dead, headless python. It had apparently exploded while trying to swallow a 6-foot-long alligator. Lighter nibbles for pythons include native birds and other crucial members of the ecosystem. "If pythons survive this cold, then that's going to tell us what a challenge it will be to get rid of them," Mazzotti said, adding that his team inserted transmitters on 10 of the snakes and will be monitoring them tonight. More popular creatures at the Miami Metrozoo are huddling under extra blankets. Ron Magill, zoo spokesman, said staffers removed chimps, gorillas and other primates from their cages Saturday and placed them in little beds with blankets, which of course they ripped. "They did a little of that but it keeps them warm," he said. Galapagos tortoises and Komodo dragons were also kept warm. And while the zoo closed for the first time in 30 years due to cold, it reopened Sunday with everyone at the ready to bundle the animals up again and shut the zoo if necessary. The cold had customers of Florida Power & Light using electricity at a record rate to heat their homes and businesses. Customers were drawing more than 23,500 megawatts of power Sunday morning, breaking the old record of 22,300 megawatt hours set in August 2005, the utility said.